Red-necked Wallaby. Photo by Gerald and Buff Corsi, © 2002 California Academy of Sciences. Red Kangaroo. Photo by Gerald and Buff Corsi, © 2002 California Academy of Sciences. it grabs on with its mouth and continues to develop, often for weeks or months depending on the species. The short gestation time is due to having a yolk-type placenta in the mother marsupial. Placental mammals nourish the developing embryo using the mother's blood supply, allowing longer gestation times. Like other mammals, the marsupials are covered with hair. 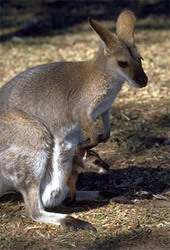 Mothers nurse their young  a young kangaroo may nurse even when it has grown almost to the mother's size. The only naturally occurring marsupial in the United States is the opossum, Didelphis virginiana. In the past, however, marsupials were quite common. During the Mesozoic marsupials were very common in North America; more common, in fact, than placental mammals. They persisted here until the mid- to late-Tertiary. Koala. Photo by Gerald and Buff Corsi, © 2002 California Academy of Sciences. 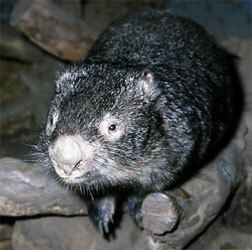 Wombat. Photo © 2005 Sharon Chester. In South America and Australia, however, marsupials continued to be an important group of land mammals. Many South American forms are similar to the North American opossum. The marsupials of South America began to go extinct in the late Miocene and Early Pliocene when a land connection with North America formed, allowing placental mammals to cross into South America. 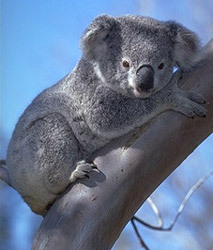 In Australia, though, marsupials continue to be very diverse, and are the dominant native mammals. They include kangaroos, koalas (above left), tasmanian devils, wombats (above right), and other typical Australian mammals. 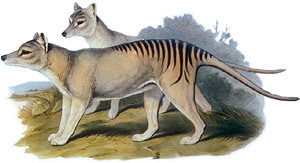 Until recently, they also included the marsupial wolf, Thylacinus (below). Like the quagga, the marsupial wolf is now extinct. The last individual was seen in Tasmania in the 1950s. Thylacinus, an extinct marsupial wolf. Though marsupials today do not have as many species as do the placental mammals, they are quite structurally diverse. 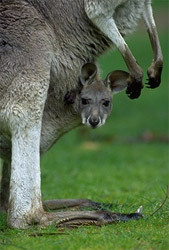 They range from small four-footed forms like the marsupial mole, Notoryctes, to the large two-legged kangaroos. There are several cases of convergent evolution between marsupials and placental mammals, in which the two animals have evolved to fill the same ecological niche in different parts of the world. There are burrowing forms, grazing forms, gliding forms, and even long-snouted ant-eating forms which have evolved independently in the two groups.